The biggest selling magic show on earth will appear in the UK featuring seven world grand master magicians in The Illusionists: Witness the Impossible. 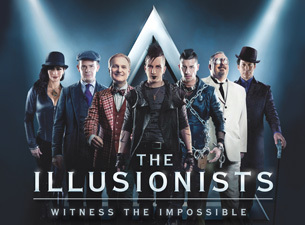 The Illusionists: Witness the Impossible launched in January 2012 with a sell-out season at Sydney Opera House, reaching an audience of 31,000 in nine days, followed by a Mexico City eight-day season with an audience of 42,000. More recently the show packed out Adelaide Festival Centre and Queensland Performing Arts Centre, and will visit Auckland before a launching world tour from London’s West End. The hand-picked cast of internationally renowned illusionists together create a blockbuster stage show featuring a stunning mix of their most outrageous and unbelievable optical illusions including nail-biting Russian roulette, jaw-dropping acts of levitation, mind-reading, disappearance and escapes. This show sees the magicians take their cue from the showmanship of the great illusionists of the past – such as Houdini – and combine it with contemporary sets, costume design, technology and live band Z, best known as touring band for hip hop legend NaS, to create a spell-binding family-friendly blockbuster. the mind-blowing entertainment that The Illusionists do at every show.